A green oasis between a beautiful beach and shops: the Felicie Cottage and Residence in the south-east of Mahé provides the perfect mix for everyone looking for an undisturbed holiday as two or three, while at the same time missing out on nothing. A private communal pool, a beach within walking distance, as well as restaurants, a bus stop, and shops can all be found on your doorstep. What more could you wish for? 60 m from the nearby Fairyland Beach. Modern cottages with a view on the communal pool. 8 x 4 metre pool with a depth of 1.7 metres. 3 bedrooms with kingsize bed, en-suite bathroom, bathtub, air-conditioning, free WiFi, fully-equipped kitchen, hotel safe, terrace, sun-loungers, outdoor shower, barbeque area, beach towels, and much more. Enjoy togetherness in combination with modern facilities at the Felicie Cottage and Residence in the south-east of Mahé. On this private estate, a green oasis of palm trees and exotic flowers awaits, alongside three freestanding cottages, one of which can be yours for your stay! Here, you can read on the accommodation’s terrace, refresh yourself in the communal pool, or sunbathe on one of the sun-loungers. Meanwhile, everything you could wish for is right on your doorstep. The closest shop is around 70 metres away, ideal for your evening meal or a small fruit snack. 60 metres from your door lies the beautiful Fairyland Beach, sometimes also known as Relax Beach, with its powdery white sand and crystal-clear water, ideal for snorkelling and swimming. Finally, the bus stop is just 50 metres away, allowing you to reach the south of the island or the capital in the north with ease. If you’d rather stay at home during your stay, then there’s much to enjoy about this accommodation. Comfortable furniture and brightly-lit rooms create a wonderful living atmosphere. Pastel tones, chic grey and noble silver lend the interior some class, while warm wooden elements create a cosy, homely atmosphere, with the ideal mix of colours and materials! The bedrooms provide stylish elements for your nights, while the kingsize beds and blackout curtains ensure a comfortable night’s sleep. The fully-equipped kitchen also has all that you could wish for. Whether you want to enjoy a candlelit dinner or an exotic fruit plate. Thanks to the private estate, you can enjoy time together with your partner with ease. Relax in the bathtub with a view of the garden, and enjoy your homemade dinner on your terrace. Whatever you choose, feel right at home here! A beautiful beach just for you? Just 6 km from the Felicie Cottage and Residence lies Anse Baleine, which is likely deserted. This small, secluded beach to the east of your accommodation is sometimes visited at the weekends by locals thanks to its shallow water and peaceful location, which make it ideal for picnics. However, during the week, you will likely feel as if you are on a desert island here. Mahé as an island offers more than just impressive beaches, however, providing hills, lush green scenery, and the 900-metre peak of the Morne Seychellois, the highest point in the Seychelles. This mountain and its national park lie about 40 minutes’ drive from your accommodation, where you can discover mangrove forests, rainforest, and giant tortoises. Enjoy relaxing by the pool amidst a green oasis. Make use of your fully-equipped kitchen and indulge yourself in your cooking. Want to try something new? Try one of the exotic fruits of the Seychelles! Enjoy the view of the pool and the garden at the end of a long day from your very own terrace. The modern Felicie Cottages make a good impression right from the start! Warm colours and wooden elements create a pleasant contrast to the high-quality surfaces and appliances of the fully-equipped kitchen. The highlight is perhaps the bathtub with a view through a window of the garden. Bedroom with kingsize bed, en-suite bathroom, bathtub, air-conditioning, free WiFi, fully-equipped kitchen with fridge, stove, oven, microwave, toaster, coffee machine, and kettle, hotel safe, terrace, sun-loungers, outdoor shower, barbeque area, beach towels, pool and garden view. 2 adults (0 - 99 years old) + 1 infant (0 - 2 years old). Bedroom with kingsize bed, en-suite bathroom, fold-up sofa bed, bathtub, air-conditioning, free WiFi, fully-equipped kitchen with fridge, stove, oven, microwave, toaster, coffee machine, and kettle, hotel safe, terrace, sun-loungers, outdoor shower, barbeque area, beach towels, pool and garden view. 3 adults (0 - 99 years old) or 2 adults (0 - 99 years old) + 2 children (0 - 11 years old). Bedroom with kingsize bed, en-suite bathroom, bathtub, air-conditioning, free WiFi, fully-equipped kitchen with fridge, stove, oven, microwave, toaster, coffee machine, and kettle, hotel safe, terrace, sun-loungers, outdoor shower, barbeque area, beach towels, pool view. You will receive 2 free bottles of water upon arrival. Please note that the bed for the 3rd person in Cottage 2 is a sofa bed. 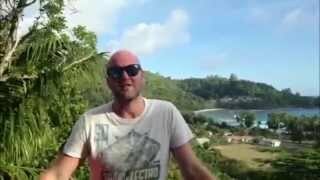 Booking for Guesthouse "Felicie Cottage & Residence (Seychelles)"